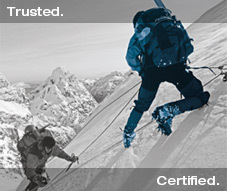 What is the Software House Dealer Certification Program? The Software House Dealer Certification Program is one of the industry's most rigorous technical certification programs, designed to ensure that only the most highly trained security integrators install and support Software House solutions. These elite certifications (Enterprise Partner, Advanced Integrator, and Certified Integrator) are awarded to integrators who successfully complete our intensive training and evaluation program. Integrators in the Dealer Certification Program are held to a higher standard so they represent our solutions in the best way possible. The integrators who commit to this program are committed to product excellence and overall customer satisfaction. In order to ensure customers receive the best possible support for their project, we match each project and its level of complexity with an integrator that has the knowledge and field experience to get the job complete to the customer's satisfaction. For a list of Software House integrators in the Dealer Certified Program, contact Joe Fitzgibbons, Dealer Certification Program Manager.